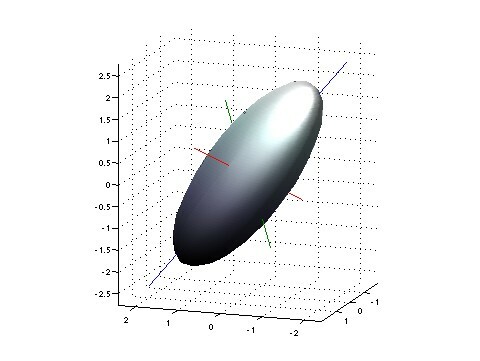 3D ellipsoid generated by xTAx = 1, showing principal axes (plotted with Matlab). You all remember solving two simultaneous equations for two unknowns in high school. Linear algebra is the elegant structure that arises when you generalize this to many equations in many unknowns. We will find such algebra problems (involving numbers and matrices) can be beautifully described by geometry (involving planes and angles). You will also grapple with some lovely math proofs. Why is linear algebra useful? The natural and technological world around us is full of complicated systems that respond to stimuli: a bridge moves when a force is applied, the population of one species reacts to a change in population of another. Very often the system is linear (or nearly so) - twice the input causes twice the output. Every time we do a Google search, make a weather prediction, solve virtually any numerical problem in physics, chemistry, biology, engineering, economics, we (or a computer) does linear algebra. Every molecule of your body is governed by quantum mechanics, which is essentially linear algebra. Finally, linear algebra, particularly the idea we introduce of a vector space, is the mathematical building block upon which functional analysis (the study of operators on continuous functions, a key part of analysis, partial differential equations, etc) is built. Required book: Linear Algebra and Its Applications, Third Edition (or `Third Revised Edition' is equivalent, I'm almost certain!) by David C. Lay (Published by Addison Wesley). Available at Wheelock Books, etc. Homework: 8-9 weekly HW's due Wednesday at start of lecture. I strongly encourage you to attempt the relevant homework problems before the next lecture. Leaving it all for Tuesday night is bad time management and risks you getting left behind in this fast-paced course. Please make your working/reasoning as clear as you can, write clearly, don't be scared of using lots of space on the page, and staple your work. Late homework will not be accepted (unless by prior arrangement for a valid, and exceptional, reason). Your lowest HW score will be dropped. Exams: I will try to give you ample time to complete exam questions. However, the only key is to practise, practise, practise. (Also read this). Midterm 1: Tuesday, July 18th, 6-8pm. Midterm 2: Tuesday, August 8th, 6-8pm. Final: Saturday, August 26th, 8-11am. Note this will not be given early to accommodate travel plans. Honor principle. Exams: no help given or received. Homework: group discussion and collaboration on problem techniques is great and helpful. Write-ups must be done individually (ie no copying). Special needs: I encourage students with disabilities, including "invisible" disabilities like chronic diseases and learning disabilities, to discuss with us any appropriate accommodations that might be helpful. Let me know asap, certainly in first 2 weeks. Also stop by the Academic Skills Center in 301 Collis to register for support services. Private tutoring: Tutor Clearinghouse may have private one-on-one tutors available for Math 22. The tutors are recruited on the basis that they have done well in the subject, and are trained by the Academic Skills Center. If a student receives financial aid, the College will pay for three hours of tutoring per week. If you would like to have a tutor, please go to 301 Collis and apply as early as possible.